The low, more rugged alternative to the Corozal Adventure, the Alpinestars Belize Drystar Boots incorporates a mix of microfiber and suede leather to make a waterproof Drystar boot that is ready for the back country. New features like the vulcanized rubber soul, the self-cleaning and self-aligning buckles, and the biomechanical lateral flexi-blade system give these boots added points for style, functionality, and safety. With a CE certification to back them, the TPU double density ankle cups, shin plates, and calf plates provide excellent support and resistance for impact. Soft foam around the ankles absorb shock and keep you comfortable while the reinforced toe box and heel add extra sturdiness. As far as waterproofing goes, the extended PU coated leather gaiter prevents any soggy, sad soles from happening. In fact, the anatomical EVA footbed with Lycra lining is replaceable so you can keep these fresh for the long haul. 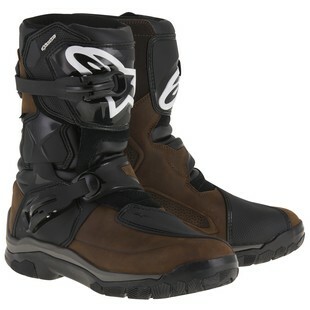 The Alpinestars Belize Drystar Boots are here to support riders looking for comfortable kicks for adventuring all terrain and all weather, on and off the bike.